An earth cooling tube, also known as an earth tube, is a long, underground metal or plastic pipe through which air is drawn. As air travels through the pipe it gives up some of its heat to the soil, and enters the house as cooler air. In the 1970s and early 1980s, earth cooling tubes received a great deal of attention from architects, builders, and homeowners as an alternative or aid to conventional air conditioning. While the concept of routing air through underground tubes or chambers to achieve a cooling effect seems like a good idea, in practice it is not very effective, both technically and economically. Perhaps a few hundred systems were constructed, but information on the practical application of the concept is limited. There are few functioning installations, and limited quantitative performance data exists. The following information is a summary of the key points from the citations in the bibliography below. Cooling tubes are long, underground metal or plastic pipes through which air is drawn. The idea is that as the air travels through the pipes, it gives up some of its heat to the surrounding soil, entering the house as cooler air. This will occur only if the earth is at least several degrees cooler than the incoming air. A cooling tube system uses either an open- or closed-loop configuration. In an open-loop system, outdoor air is drawn into the tubes and delivered directly to the inside of the home. This system provides ventilation while hopefully cooling the home's interior. In a closed-loop system interior air circulates through the earth cooling tubes. An alternative is to direct the cooled air from either type of system into a mechanical air conditioning system to reduce the air conditioner's cooling load. A closed loop does not exchange air with the outside; instead the system recirculates the home's air through the earth cooling tubes. This makes the closed loop system more efficient than an open loop design, since it does not require as high a degree of dehumidification as an open loop system. The main considerations in selecting tube material are cost, strength, corrosion resistance, and durability. Tubes made of aluminum, plastic, and other materials have been used. The choice of material has little influence on thermal performance. PVC or polypropylene tubes perform almost as well as metal tubes; they are easier to install, and are more corrosion resistant. Optimum tube diameter varies widely with tube length, tube costs, flow velocity, and flow volumes. Diameters between 6 and 18 inches (15.2 and 45.7 centimeters) appear to be most appropriate. Earth temperatures and, consequently, cooling tube performance vary significantly from sunny to shady locations. Where possible, the inlets in open loop systems and the cooling tubes themselves should be placed in shady areas. 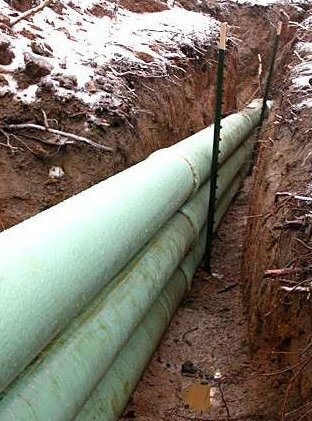 Tubes should be buried at least 6 feet (1.8 meters) below grade. Only rarely is burying them more than 12 feet (3.7 meters) justifiable. When digging trenches at these depths, cave-ins are an extreme hazard, and appropriate precautions should be taken. The temperature of the earth at depths of 20–100 feet (6.1–30.5 meters) remains about two to three degrees higher than the mean annual air temperature. At depths less than 10–12 feet (3.1–3.7 meters), earth temperatures may be strongly influenced by air temperatures and may vary during the year, depending on the locale. Near the surface, earth temperatures closely correspond to air temperatures. There is no simple formula for determining the proper tube length in relation to the amount of cooling desired. Local soil conditions, soil moisture, tube depth, and other site-specific factors should be considered to determine the proper length. The amount of heat conducted and how widely it is diffused varies from one soil type to another. The moisture content of the soil is a major influence on conductivity and diffusivity, and accounts for large variations on how heat moves through the earth. Earth cooling tubes are likely to perform poorly in hot, humid areas, because the ground does not remain sufficiently cool at a reasonable depth during the summer months. Moreover, dehumidification, another equally important aspect of cooling, is difficult to achieve with earth cooling. Mechanical dehumidifiers will most likely be necessary. The dark and humid atmosphere of the cooling tubes may be a breeding ground for odor-producing molds and fungi. Furthermore, condensation or ground water seepage may accumulate in the tubes and encourage the growth of bacteria. Good construction and drainage could eliminate some of these problems. Insects and rodents may enter the tubes of an open-loop system. You should install a sturdy grille and insect screen at the tube inlet to deter potential intruders. Earth cooling tube systems can be very expensive. Considering current electric power rates and the cost of materials and labor, it is unlikely that an earth cooling tube installation can be justified on economic grounds alone.